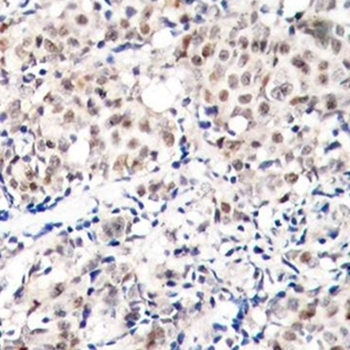 Rabbit anti p27/Kip1 (pThr187) antibody recognizes p27/Kip1, also known as cyclin-dependent kinase inhibitor p27 or cyclin-dependent kinase inhibitor 1B, when phosphorylated at threonine 187. p27/Kip1 is a cyclin-dependent kinase inhibitor (CKI) that belongs to the Cip/Kip protein family (Cerqueira et al. 2014). p27/Kip1 inhibits cyclin-dependent kinases (CDKs) and cyclin-CDK complexes; playing a role in the regulation of cell cycle progression at G1 (Cerqueira et al. 2014). Phosphorylation of p27/Kip1 at threonine 187 by CDK2 leads to the ubiquitination and subsequent degradation of p27/Kip by the 26S proteosome (Das et al. 2016). 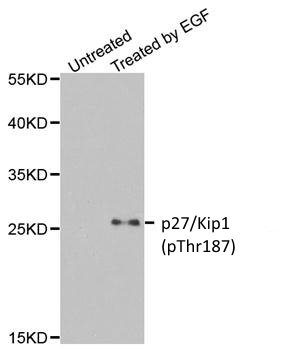 Antiserum to p27/Kip1 (pThr187) was raised by repeated immunization of rabbits with highly purified antigen. Purified IgG was prepared from whole serum by affinity chromatography. Cerqueira, A. et al. (2014) Genetic characterization of the role of the Cip/Kip family of proteins as cyclin-dependent kinase inhibitors and assembly factors. 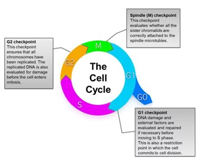 Mol Cell Biol. 34 (8): 1452-9. Das, R.K. et al. (2016) Cryptic sequence features within the disordered protein p27Kip1 regulate cell cycle signaling. Proc Natl Acad Sci U S A. 113 (20): 5616-21.